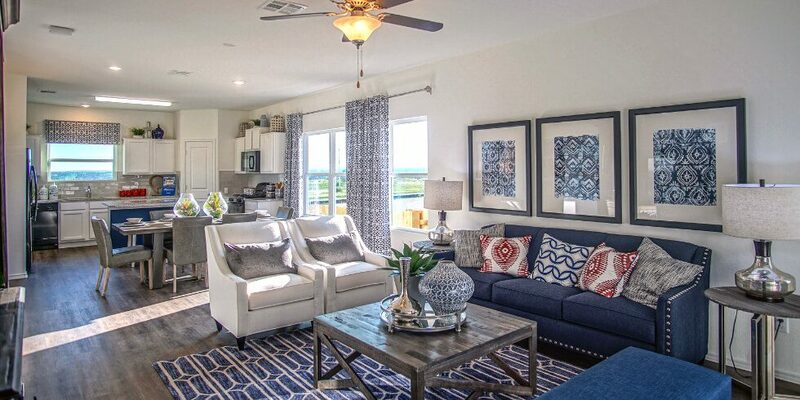 Orchard Ridge, one of Liberty Hill’s newest master-planned communities, is open to tour today! Come visit our vibrant community and discover the Orchard Ridge difference. Stop by the Activity Center and chat with our Lifestyle Director to learn more about our amenities, then head over to tour gorgeous, fully furnished model homes by our award-winning home builders. Check out sneak peeks of the model homes from our renowned builders below. With a focus on transparency and value, the homebuying process has never been easier than with Dream Finders Homes. Dream Finders Homes is offering homes starting from the mid $200s that range in size from 1,700 to 3,331 square feet and feature three to five bedrooms and two to four bathrooms. Buffington Homes is an iconic native Austin builder with more than 40 years of experience crafting beautiful homes built to withstand the Texas elements. Buffington Homes is offering a variety of homes starting from the mid $200s. With three to five bedrooms, homes range in size from 1,772 to 2,926 square feet. Lennar’s Everything’s Included® program ensures that you’ll get the most sought-after features, like stainless steel appliances and upgraded bath fixtures, all at the best price possible. Lennar is offering homes from the low $200s that feature three to four bedrooms and rang in size from 1,242 to 2,348 square feet. Orchard Ridge was designed for today’s way of life, from the thoughtfully designed amenities to the modern home designs. To learn more about everything Orchard Ridge has to offer, join our Interest List or schedule a tour.